Silent films, even after the success of The Artist, appear to be an acquired taste. I still find too many people either frightened or dismissive of movies with no dialogue. The term 'silent film' is a misnomer, because they were never truly 'silent'. There was a pianist, organist, or even a full orchestra to accompany the images, and there are some simply beautiful images to go along with the films. Sadly, a good number of people look on 'silent film' as something to avoid, like Shakespeare or broccoli (all of which I enjoy). I think they rob themselves of great pleasures, because if you see silent films, you see an artistry, a beauty, and some extraordinary stories that aren't encumbered by translations or accents. Carla Laemmle, niece of Universal Studios founder Carl Laemmle and one of the last people who not only remember silent films but actually worked on them, has died at 104. Why should her passing make me sad? Well, for one thing, I admire the films she was in. Who up to yesterday could have said they worked with Lon Chaney, Sr. on the original Phantom of the Opera? 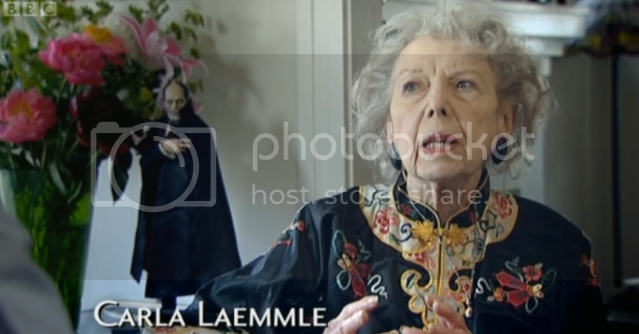 She remembered Lugosi in his iconic turn of Dracula. These precursors to horror films (which are still watched and have influenced generations of film-viewers and filmmakers) relied more on atmosphere, on what wasn't seen, that overwhelm us with blood and gore. Today, perhaps they are not as frightening as they were when released, but these films have stood the test of time. Though the gap between her last film (1939's On Your Toes) and her 'comeback' (2010's Pooltime) is longer than some people's lives, I think the most important role Carla Laemmle played was as Ambassador of Cinema to the World. She was not just someone who provided first-hand knowledge of the early days of film but was a tireless advocate of silent and early sound films. She continually spoke up and out about the importance of these films and the pleasure one could derive from them. Her insights and the sheer pleasure she communicated from sharing her memories made what appears to be such a distant time, place, and subject into something so much closer and fun. I would see Carla discuss how wonderful Universal Studios was in its early days, of her uncle and cousin Carl, Jr., and of the work they did fighting to be among the big studios like Warner Brothers or MGM, and of how the truly classic films like Phantom or Dracula came to be. She was the best spokesperson for that long-lost era where filmmakers took risks, didn't focus test films to death, and let the creativity rule. They were in the business of making money, no doubt, but were also encouraged to make film into a legitimate art form. They knew it took money to make money, and it was all up there on the screen. There are now a few, very few, people left to remember those early days of silent or pre-Code films: Diana Cary (better known by her stage name of Baby Peggy, child star), Luise Rainer (currently the oldest Oscar-winner at 104), Olivia de Havilland (at 97 the last surviving cast member of Gone With the Wind, who ironically played the only character to die in the film). With Carla Laemmle's death, I think we not only lost someone who could speak about a time none of us will know, but someone who never tired or flagged in her outspoken and genteel manner about why these films mattered. NIGHT AND DAY (1949) was Carla's Laemmle's last Hollywood movie before she appeared in POOL TIME. Thank you for the info. Night & Day is not listed on her IMDB credits, which is where I got my information.